On Thursday morning last week, I had a stroke of genius. I was looking around my living room, thinking that it would be nice to find a way to display some of Jack's recent creations, when BAM! I got it. Fingerpaint. On a canvas. Done. Problem was, I didn't have any fingerpaint. All I have are acrylic craft paints, and I didn't really want Jack dipping his hands repeatedly into that stuff. So what did I do? I took to the internet. And the internet came through! 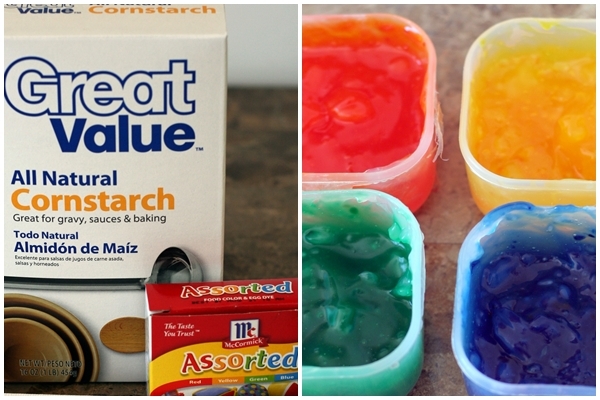 I found a SUPER simple recipe for fingerpaint (3 cups boiling water, 1 cup corn starch, food coloring) from this website, gathered up the few supplies I needed, and we got to painting! The paint did turn out a little lumpy in texture (see picture on the right), although I attribute that to operator error in this case. I don't think I let it get hot enough after I added the cornstarch. To my surprise, Jack really wasn't interested in actually painting with his fingers, but once I handed him a paintbrush, he got down to business (also - I am glad I used this kid friendly recipe instead of my craft paints, because one of the first things he did was to put a big brush-full of green paint straight into his mouth). He painted for about a half an hour, which is a pretty long time for a toddler to spend on one particular activity, so I will definitely be repeating this craft! Also? My hallway 'art' is fabulous. One of a kind. Priceless (to me). What an excellent idea! My Q doesn't like to use his fingers, either...much prefers a brush. Thanks for the homemade idea, I'd much rather do that than use the noxious smelling store bought stuff. And your art is absolutely priceless! 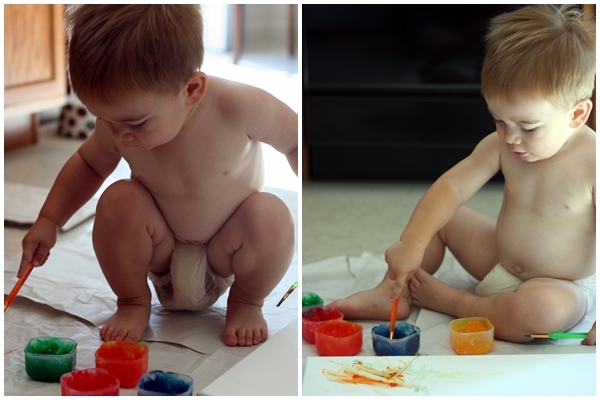 We haven't tried fingerpainting (yet). But this is an excellent recipe that I'll totally keep in mind. PS- I totally agree about kid artwork being the best! I'm still contemplating a couple of options that would show off Lizzy's artwork in our house! I love this! totally going to have to try it! I did mean to add that despite my fears, the paint didnt stain his skin at all! What a great idea! I'm off to get food coloring today! Meh I have seen better. LOL He is a genius! Photographer, Artist what next? Oh my goodness! As an artist and art therapist, I LOVE LOVE LOVE this! What a perfect way to spend time together! Excellent, work.